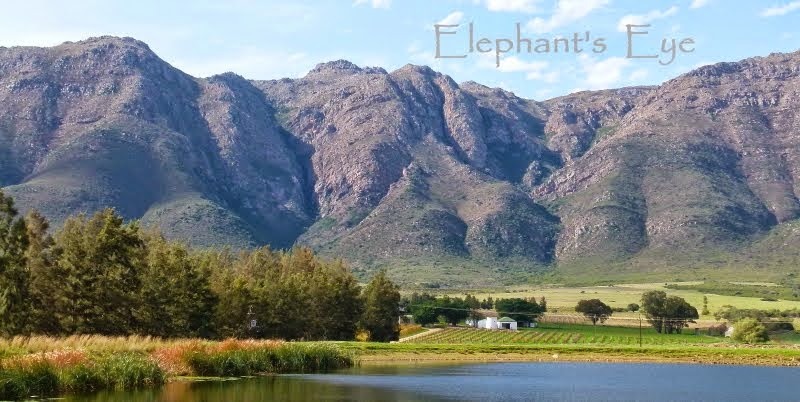 We reached the Groot Winterhoek Wilderness Area as the manager left for lunch. Never saw another soul for the three hours we walked. 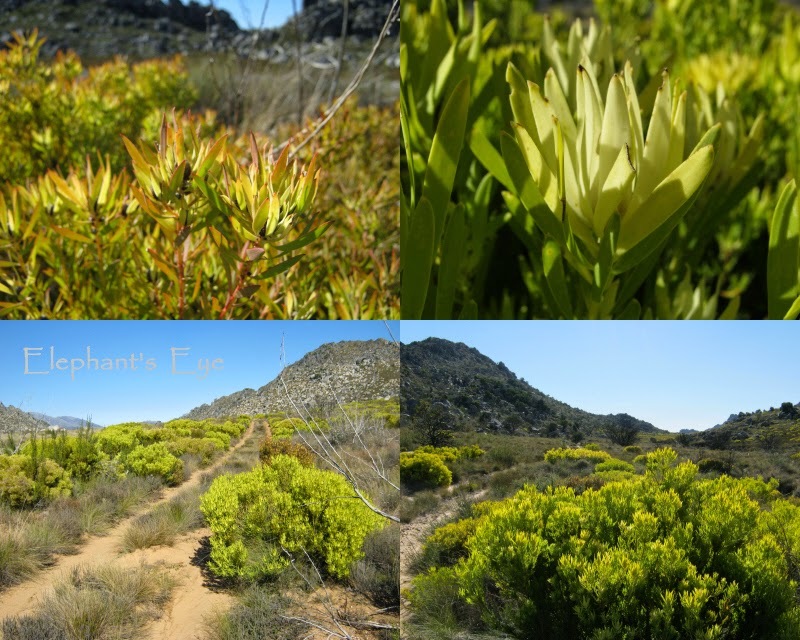 There are 79 species of Leucadendron, male and female plants are different, making them difficult to name. 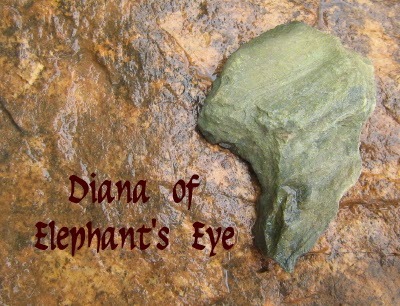 There is one spectrum ranging from ivory thru lime to gold. The colours were striking as we set out, but when I turned for home, backlit like stained glass windows! Some reach across to the other side, bronze to coral to wine-dark. We saw the very last of the snow on Klein Winterhoek. 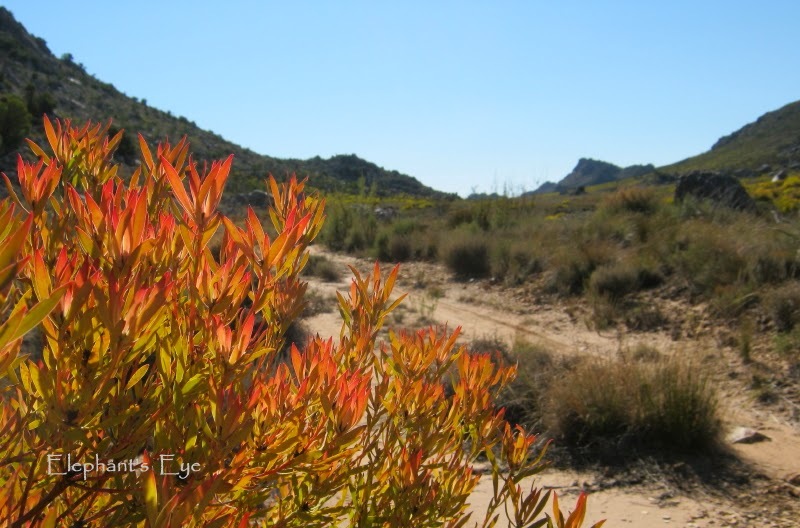 Along the road, across the landscape, it seems each bush chooses its own colours. 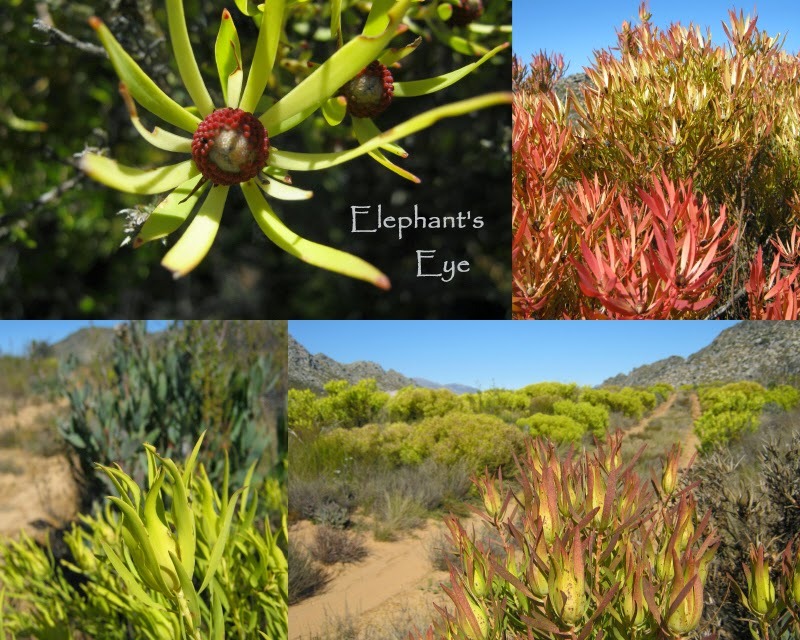 For the False Bay garden I will seek out a family of sunshine and firelight Leucadendrons for an explosion of colour in winter. Hibiscus tiliaceus will carry me thru the rest of the year. My cuttings are still deciding whether they want to grow with us in False Bay, but I have time to try again. We walked from the gate, past the worker's cottages where they are beginning to use solar panels. 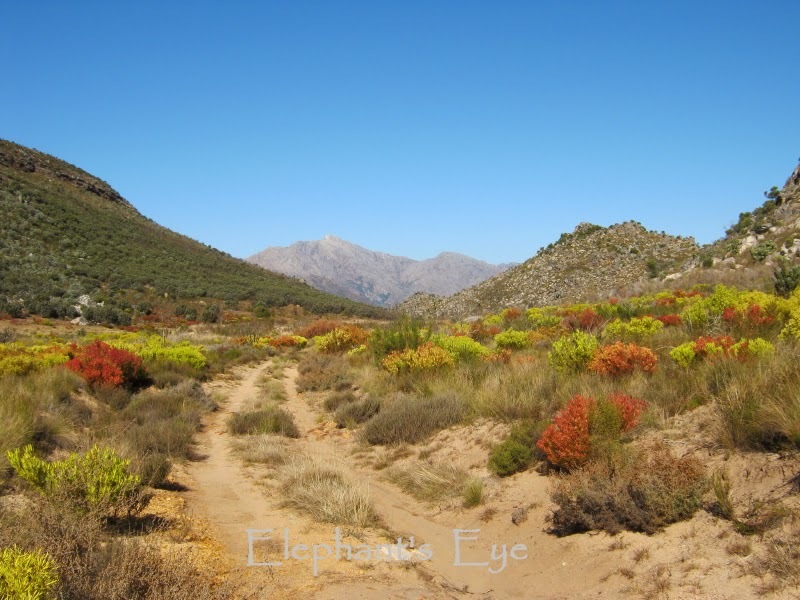 Down past the oak tree and burnt forest of waboom proteas, across the forehead of our elephant. 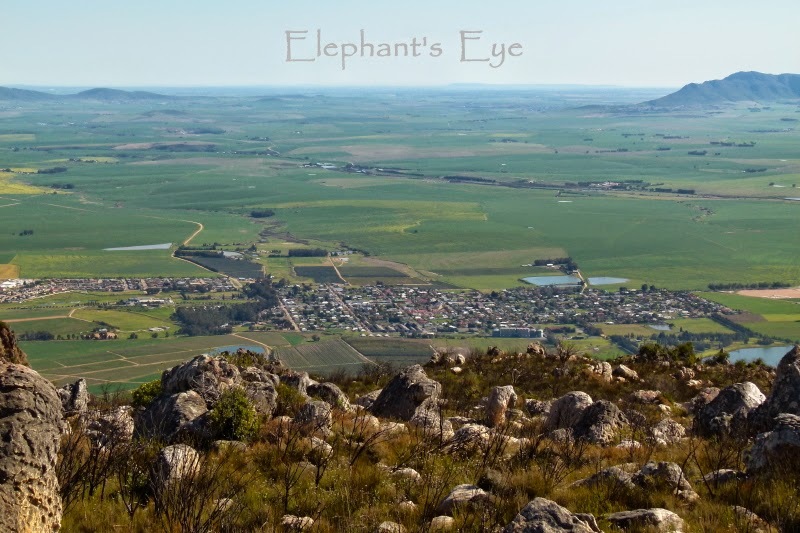 From where he clambered over rocks to look down to Porterville and across the valley to Piketberg (for which our neighbouring town is named). Along a valley we walked, with grass growing on once were fields where the farmer must have battled to survive. 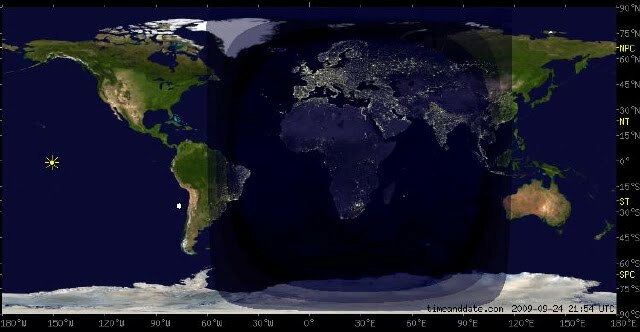 We were not quite alone. Along the jeep track, next to our boot prints, were tracks from a small cat and a grysbok. Fresh lilac and white counterpoint to the gold and russet, comes from Muraltia heisteria. Named for a Swiss botanist Von Muralt. 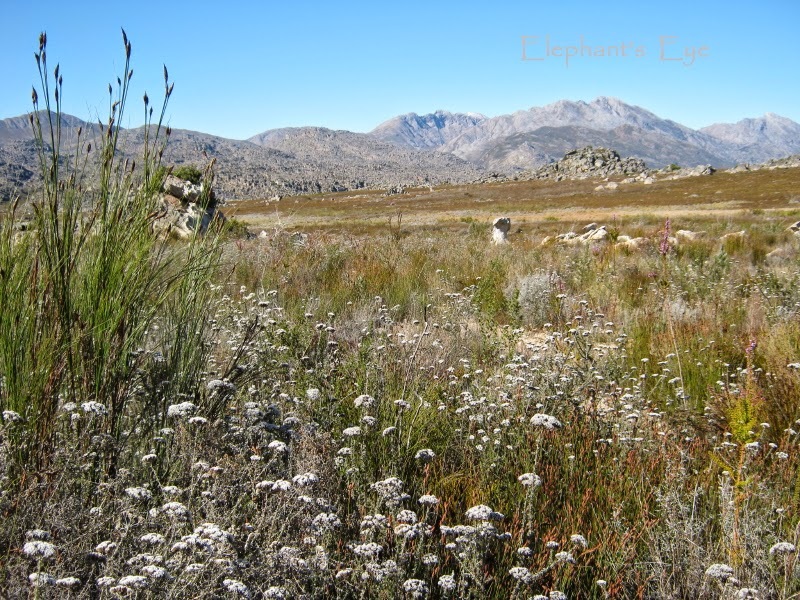 115 species of Muraltia, all in Africa, 110 endemic to the South-Western Cape with its winter rainfall! Prickly shrub in the Polygala milkwort family is listed as a weed in Sydney, Australia. Protea ? Protea holosericea ? True proteas. 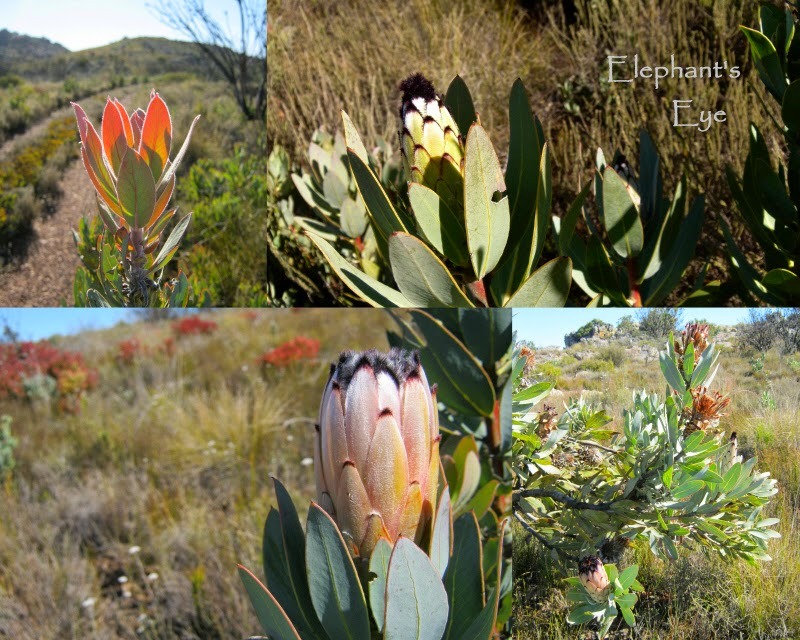 69 species in our fynbos, found from Clanwilliam to Grahamstown. A haze of tiny white flowers on Metalasia muricata echo that last wisp of snow on the distant Groot Winterhoek. A shrubby daisy bush with honey-scented flowers. Thinking of Namaqualand spring flowers and flower shows. 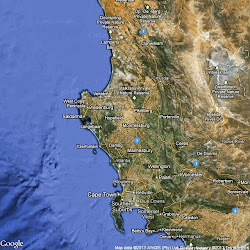 This year we plan to go to Clanwilliam, and Postberg at the West Coast National Park. Next year Darling and Hopefield. Perhaps Namaqualand? 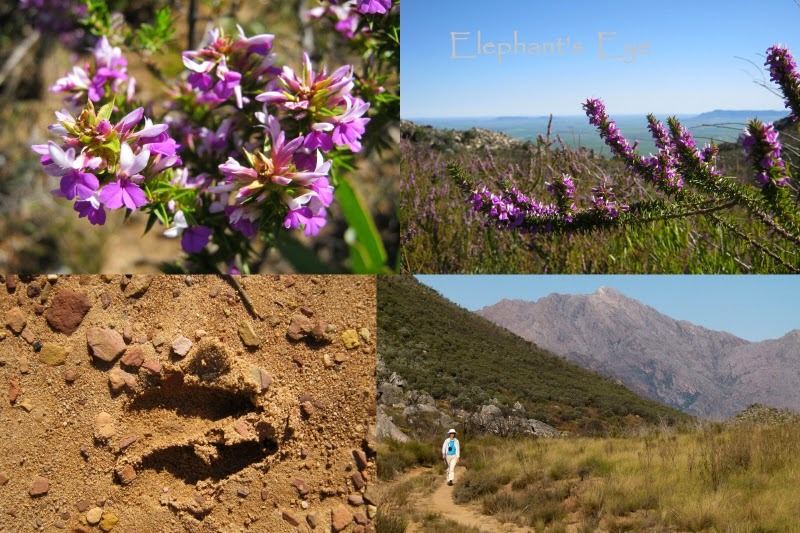 From the Wild Card Blog 1 August 'along the Cape Flower Route' for when and where in 2014.
thank you so much for this wonderful pictures. Quite a journey!!! Love to see these all! Thank you for the walk, Ma'am, and for the reference ;). Those golden/chartreuse and vibrant orange/red colors of the Leucadendron are among my favorites for plants. 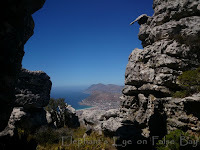 And the broader shot of the Klein Winterhoek is stunning. Hiking is fabulous, isn't it? As my friends struggle to keep up their younger-years gym routines and knee-pounding running, I quietly continue hiking--exercise that can continue (God willing) for most of us much longer. I enjoyed your views and all the incredible plants. Walking at my own pace, on the level (jeep tracks are wonderful!) Stopping for flowers and photos- my favourite way to spend a few hours. Just saw your note about your house maybe being sold! Tentative congratulations. Keep us posted. I too enjoy the hiking and you live in such a beautiful part of the world with those mountains and colorful valleys. The wildflowers are quite special in color and form. I can only imagine your wildlife, so different than here in the States. I found myself completely engaged with your post because of the recollection I have of making all my own dyes for wool from plants many years ago. I would spin and dye the wool and then use it to weave on a 4-harness loom. 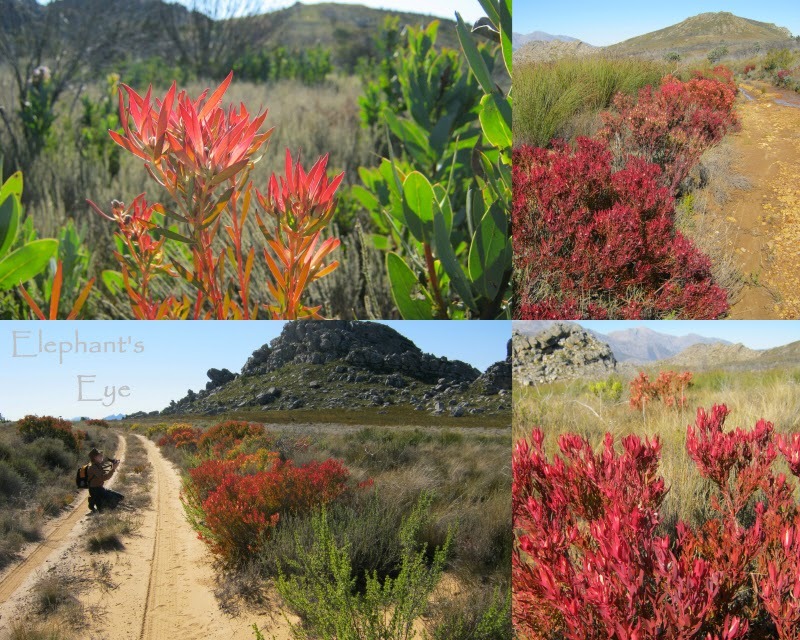 Not only madder and sumac, but all the plants you show from the Leucadendron family, are high in anthocyanins, from which are derived the deep reds and purples that are so highly prized. This material is typically found in the leaves, stems and roots of the plant and makes for saturated, rich color. Anthocyanins are another reason we have our berries rich in color i.e. blueberries, cranberries, cherries, red raspberries, etc. 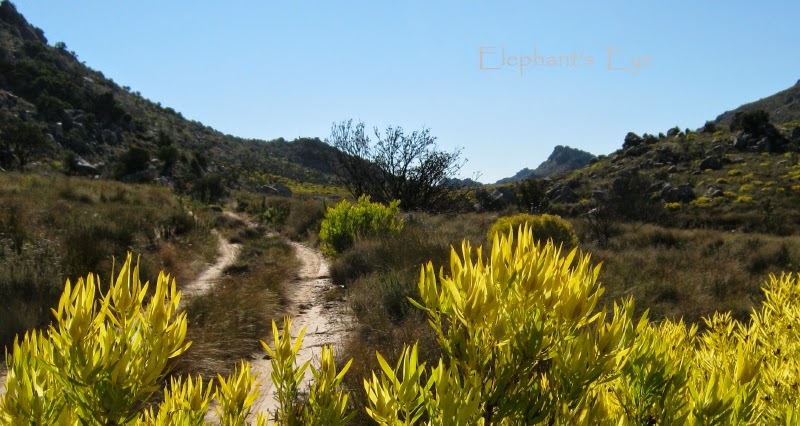 In the American Southwest, Native Americans made exquisite rugs from wool dyed from these plants. Thank you for showing your gorgeous landscape, which is so different from my own, and therefore so fascinating. If our municipal water is not treated, it comes from the mountain a deep dark brown. Years ago my little city nieces refused to get into a country bath filled with BROWN water! Susie, having read your recent post I see you and your sister in the sculpture at the Owl House on my new blog. Diana I am enthralled with this wild area and its incredible fiery colors. I can see why you want to take some with you...I also would love to see more of the Metalasia muricata. those teensy greyish white flowers are difficult to capture on camera, but lovely in life. still on tentative tenterhooks, but we are Under Offer.